I keep offering this for sale when people ask for rotary/Leslie pedals so I figured I might as well put up an ad. Neo Instruments Ventilator rotary cabinet simulator and matching remote footswitch. "The Ventilator is a rotary speaker simulator which captures all the nuances of a real Leslie 122 mic'd in stereo. Over 2 years of research and development by Neo Instruments went into this truly mesmerizing and portable effect, resulting in accurate ramping up/down of both upper and lower rotors, realistic tube amp saturation, and the same frequency response and crossover as the original cabinet. 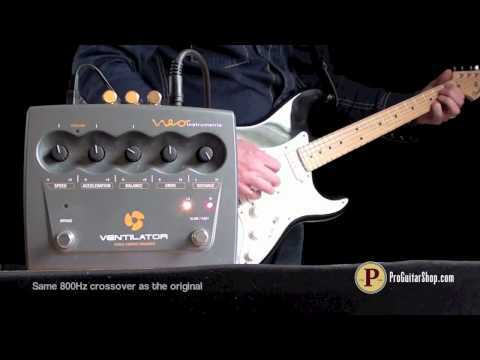 The Neo Instruments Ventilator can be used for guitar or keys with built in speaker simulation and be controlled via a remote speed/brake switch." Ha ha ha - I forgot I'd already posted an ad here! This one's better, and it looks like the price has dropped since February! Duplicate removed. Otherwise, when I chastise a freeloader for multiple adverts he might hold @robinbowes up as an example of “favouritism to well known member”.